Garden Centres? The Full Circle! I had such a great experience on Saturday, I want to share it. But first to tell you I have a painting hanging in my utility room. The subject matter is a corner shop with a signboard over the door saying PARAFFIN – 62 – WICKES HARDWARE. Under this, the words GARDENING CENTRE and stuck inside the window a poster advertising Brook Bond Tea. The whole painting is really rather amusing and standing out on the pavement are many of the items that would have been sold in this Gardening Centre on Cross Street, Islington in the 1970s. There is a bag of Fison’s something-or-other, lawn edging, pot plants, trellis, incinerator and even a deck chair. Customers are busy going in and out and there is someone’s patient husband sitting on a chair outside the shop waiting for his wife, I suppose. The important point is that this picture raises a big smile whilst capturing an historical moment in the early life of shops known as Garden Centres. From this point things became very different and in the eighties Garden Centres became more social and very comprehensive. They had a car park and wares included imported and exotic plants, gift shops, coffee shops and selling dreams. Prices climbed in proportion. Today some of our Garden Centres are now ‘Destinations’. One Garden Centre near to me boasts a marina, restaurants, clothes, bakery, vegetable, fish and butcher’s shops, special feature days, and more. No less, it was ‘opened by Royalty’. A far cry from my amusing picture of Wickes’ Gardening Centre at number 62! However, on Saturday morning I went to the gardening shop at Newton-the-Willows Gardeners’ Association situated at the entrance to a large Allotment. Now this Gardening Shop really does just what it says on the tin! Cars queued for miles to get a place to park and when one did get inside there was a hugely thriving gardening shop charging very reasonable prices for home grown plants and all the strictly gardening sundries you could think of. It was a joy to see the enterprise. They make some money and this goes to benefit the Association. So perhaps we have come full circle and real gardening shops for real gardeners will return. I really do hope so. The shop at Newton-le-Willows was so wholesome and affordable. Visit here for the website and do leave a message to say that you have visited their website. This brings me to question – What kind of Gardening Centre is The Recycle Works with our one-stop e-commerce Gardening Catalogue? Perhaps we are a 21st century armchair Digital Gardening Centre who knows? The Strawberry Raised Bed – Now Available! We also have another wonderful new product – The GYO Strawberry Table Raised Bed – or ‘The Frustrated Slug’! In our family it will be the frustrated cocker spaniel who can pick strawberries in a trice with her gentle mouth and never puts them in the basket. In line with the professionals and in response to a customer request we have made you a Strawberry Growing Table. A brilliant idea, which, with a twist of Vaseline on the legs it will confound the slugs and all the Snails, and all their rellies too! Just think with a little bird netting and tie the children’s hands together you stand a good chance of getting a 100% Harvest! Needless to say you can grow what you like, salads for example, but we had Strawberries in mind when we made this Strawberry Table Raised Bed. This is the best bit of the job when I indulge my pleasure in our new Pope Charcoal Kiln. Such a lot of fun has gone into the development of this absolutely unique portable charcoal making kiln. We know you don’t all go coppicing and will not have any need for one of these kilns, but please take a minute to look at the slide show. We attracted a few keen helpers on this burn. This is a very environmental item/occupation, extremely useful to all of you who have a Log Splitter or chain saw. Charcoaling logs in a kiln drives off the moisture in the logs and will substantially increase the heat they give out when used on a log fire. This is called a half burn. If you do a full burn then you get solid charcoal suitable also for burning on log fires and for the ubiquitous barbeque. We even put a few small twigs of ash into a sealed tin and buried it between the logs which gave us charcoal suitable for drawing. I think this is an occupation for wannabe Boy Scouts and you can count me in! If you really really want one delivery is about 3 weeks at this busy time. The Recycle Works Now Offers a Six Pack! We have been watching a bit of Gardener’s World on Telly and we saw the great idea of the GYO Mixed Vegetable Box Raised Bed. So, if you are NOT a dab hand at the hammer and screws activity we have one here, just for you at a price you would find difficult to match if you DIY it yourself! Naturally, from The Recycle Works there are no nails, no screws and no holes to dig and it is delivered FREE to your door – with the compost too if you like. You can get one here! Or, if you are just tasting the alluring GYO pastime try one of our new Starter Kit Raised Bed options. Without doubt they are the best value in town right NOW. So what’s stopping you getting into GYO? Go on, grow your own!! There are times when people who also own their companies tell me some terrible stories about customer behaviour. It makes me so thankful that our customers come from a really caring environment and who practise lifetime skills, bent on bringing an improvement to their own and other peoples’ lives. So, it is thank you time for being such fabulous customers! We are so fortunate to have you and we really do appreciate you. 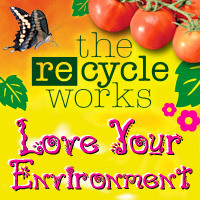 You are all so nice and we often hear that you are pleased with The Recycle Works too. However we are not complacent and we do like to know when there is something we can do better. At least we can give it a go. So, bring it on! We want to improve further. Eggs With A Difference This Easter! As it’s Easter, we thought we’d share with you this wonderful wartime tip! Grow your seedlings in egg shells as they make great seed modules….. and are even better as of course they’re compostable. So when you’re looking for activities this Easter weekend, why not think about decorating the eggs and then use them to grow your seeds?